Lavonia, GA, U.S. – (December 15, 2017) Nightforce® Optics, leading manufacturer and marketer of premium sport optics and related products including riflescopes, spotting scopes, and accessories, today introduced a completely new category of optics to their line of finely crafted and durable riflescopes. The state-of-the-art NX8™ series is built upon the legendary NXS™ family of riflescopes, well-known for their robustness and battle-proven design. Applying the latest technology and scientific advancements in optics, Nightforce designed the new NX8. The first riflescope unveiled in the NX8 family is the new NX8 1-8×24 F1 optic. Specifically designed for short -to medium-range shooting, the compact NX8 1-8×24 F1 riflescope delivers trusted Nightforce performance to virtually any rifle platform, and boasts true 1x capability. “Constructing such a small riflescope to surpass the performance of most larger scopes entails a solid commitment to innovation and optical technology,” said Nightforce Director of Sales and Marketing, Gordon Myers. As targets increase in distance, the intelligent FC-MIL™ or FC-MOA™ first focal plane reticle options provide precise hold points. For those preferring to dial for long shots, the turrets feature Nightforce ZeroStop® elevation-adjustable technology with windage limiter, allowing for a rapid return to absolute zero regardless of any previous elevation adjustments. Adjustments are a true .2 Mil-Radian or .50 MOA. And, to aid in fast magnification adjustments, the Power Throw Lever (PTL) is included. On display at SHOT Show 2018, in Las Vegas, NV, the compact and lightweight Nightforce NX8 1-8×24 F1 adds flexibility to your shooting options with fast target acquisition at a variety of distances. Please visit us in booth #20449. For information on the new Nightforce NX8 1-8×24 F1 riflescope, click here. Steiner Optics had a lot to offer this year, especially for the Military and Law Enforcement crowd. First, Steiner is offering the R1X Red Dot Tactical Series of Optic. The R1X Optic, which MSRP’S around $630, features a 1x magnification, choice of a single or 3-dot stadia reticle, low profile for co-witness capability, 7 levels of illumination (2x night vision / 5x daylight), available with standard and QD mounts, is parallax free and is waterproof, fogproof and shockproof. The R1X is 2″Hx3.1″L and weighs in at 19.4oz. Steiner Optics has updated the M332 and the M536 Battle Sights with a QD Mount. Pictured above, the M332 prism sight offers a 3x fixed magnification with a 32mm objective lens and features multi-coated lenses, an illuminated ballistic reticle and is waterproof. The M332 MSRP’s around $675. Pictured above, the M536 prism sight offers a 5x fixed magnification with a 36mm objective lens and features multi-coated lenses, an illuminated ballistic reticle and is waterproof. The M536 MSRP’s around $750. Designed for Patrol and Tactical Operations, Steiner has introduced the P4Xi scope. The P4Xi features a 1-4x variable zoom with a 24mm objective lens, a 30mm tube and the new P3TR illuminated reticle for fast target acquisition. The P4Xi Riflescope MSRP’s for $579.99. For 2017, Grey Ghost Precision had a lot to offer at SHOT Show. GGP has your 9mm Glocks covered. Starting off with GGP 9mm Barrels for the G19 and G17, both retail at $179.99. Next up for the Glock is the GGP Glock Slide for the G19 and G17. The GGP Glock Slides will come either completely stripped (lacking all internal parts) or completely assembled. There are models that offer a Trijicon RMR cutout or not. The stripped slides start around $375 and the complete slides start around $475. GGP, in partnership with Kruger Optical, has two carbon fiber wrapped scopes that they have added to their inventory. The CF-5 Carbon Fiber Scope weighs in at 14.3 oz, is constructed of a carbon fiber frame, is water proof, offers shock resisstance (1000 cycles at 750g) and comes with a Limited Lifetime Warranty. The scope is 1-5×24 with a 30mm tube, has an illuminated reticle and adjustments of 1/2 MOA per click. The CF-5 is approximately $1249.99. The bigger brother of the CF-5 was delivered to the GGP crew this morning at the show. It has yet to be named. The scope’s magnification is 3-18x50mm, has an illuminated reticle and offers 0.1 MRAD adjustments per click. This scope’s MSRP has yet to be determined. Lastly, GGP introduced the Grey Ghost Precision Grim Rifle. The Grim is chambered in 6.5 Creedmoor, is equipped with a 22″ SS Proof Research Barrel, has an 18″ Rail, ambidextrous bolt release, Superlative Arms adjustable gas block, Gen 3 Magpul PRS stock and comes standard with a CMC 2-Stage Flat or Curved Trigger. The Grim will retail for approximately $3100. New for Trijicon in 2014 is their Variable Combat Optical Gunsight, or VCOG, which has a 1-6x range and continues the tradition of rugged capability expected from Trijicon. The VCOG has seven different FFP reticle choices, functions on a single AA battery for a continuous 700 hours of operation, and is rail mounted. The VCOG offers 6 brightness settings with off settings between each brightness setting. The first VCOG model to be introduced will be the 5.56 77 gr model, with 7.62 175 gr and 300BLK models to follow. The VCOG retails for $2,800.00. 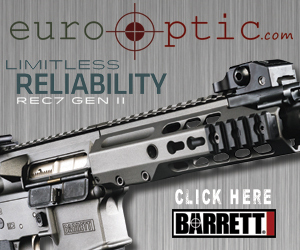 For more information visit, http://www.trijicon.com, or call 1-800-338-0563.